Tiny House Planning - The Tiny House UK "Office". If I buy some land, can I live in a Tiny House? As a static garden building the Local Authorities have rules that need to be adhered to when placing your Tiny House. Tiny Houses have been designed to comply with both planning regulations in the UK as well as complying with Road Traffic Regs for the transportation of such buildings. The Height of Your Tiny House will be within the 4 meters permitted for garden buildings (Duel pitched roof) and 2.5meters for flat roofed (slight slope) that includes Tiny Houses on a chassis. All Tiny Houses are built to a maximum height of 3.95 meters (including chassis.) When siting your Tiny House in the garden or grounds, there are some golden rules as well. Tiny Houses have to be 2 meters from a boundary. If your Tiny House is to be located within 1 meter of a boundary, then your Tiny House will be a single pitched roof with a height of no more than 2.5 meters. However, a Tiny House is on wheels and is not a permanent structure! Check with your local planning office as all cases are viewed individually. Tiny Houses on the move. Although your Tiny house will be delivered in kit form for self-assembly, it is important to remember why you bought a Tiny House. You may be a student, finishing University, debt free and in possession of a Tiny House still on campus grounds. So, do you sell it on to help an entrant, whilst giving yourself a financial leg up at the same time? Or, do you pitch it with Mum and Dad for a year or two whilst you get your feet on the ground? After all, you have no debt and on the housing ladder, RIGHT? Or, in time, you may decide that you want a different view and decide to turn your Tiny House to face the trees or rivers or hills or valley’s or anywhere you please (STPP). You may be part of a Tiny Community which has to jiggle plots every now and then to make way for new contributors to your community. As certain tasks or roles are fulfilled, skills may be needed elsewhere, developing other Tiny Communities. People will move on at some time in their life and it makes sense to be prepared for it even if you think it will never happen. Being prepared is an integral part of the Tiny House movement. What we’re saying is that one day, you may have to move. So, after many years of Designing, tinkering, toying, building and re-design, Mark has problem solved both the challenges to the build quality and also to comply with the Tiny House Movement philosophy of free roaming. 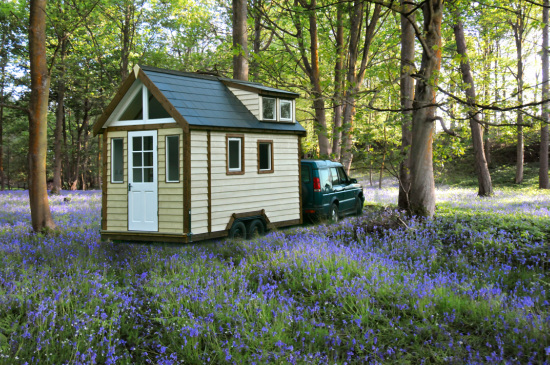 Tiny Houses are within the road legal width restrictions imposed on the UK road network. Tiny Houses fit under motorway bridges with 3 ft to spare. They are no more than 2.5 meters wide, which means that a competent driver with a "category BE" on their driving licence can tow or carry it. Towing over distance is not recommended… A Tiny house is not a Caravan although if it could be classified as one it would be compliant as the ceiling height is under 3.2 meters. If you are going to tow one. Then make sure you have a vehicle of at least equal weight to it. A minimum of a Transit type vehicle is good or a large 4x4. Some Transition Towns and Green Communities have vehicle sharing schemes. Tiny Houses are road legal. They weigh about three tons inclusive of chassis. Remember, we are not in a position to give planning advice, only your local council can do that so please check with your local planning office.